fleet street fox: How to have a healthy headline. HEALTH tourists. Dontcha just hate them? Coming over here, watching our Royal weddings, and having their appendix out on the NHS for free before they go home. Today we're warned that they could be costing us £2billion a year! Filthy, sick foreigners! Never mind the fact we're told tourism is worth £115bn a year to Britain, supporting 2.6million jobs and providing almost nine per cent of our GDP. If you just look at the numbers you might think we can easily afford it and still make a healthy profit; but that's not the point. The point is that they're foreign. And they're ill. And they're a great way of grabbing some headlines. They first grabbed headlines in March, when the Prime Minister made a speech announcing a crackdown on migrants. We all love a good crackdown, and he announced a longer wait for housing, no more driving licences for illegals (They applied? Srsly?) and that the NHS would claw back money it spent fixing up crocked foreigners. Soon after Health Secretary Jeremy Hunt was asked about the cost of health tourism and said: "We don't want to speculate but we have heard it's £200m." That's not exactly scientific - it's anecdotal, because the NHS doesn't check passports at the door. And if this guess is correct it constitutes just 0.18 per cent of the health service's total £109bn budget. And by comparison obesity costs the nation between £4bn and £6bn a year - 20 to 30 times as much. But whatever, there's no headlines in that. So in April the figure was £900m. By June it morphed into £24m in unpaid bills. At the end of the month it went back up to £200m again with further promises of a crackdown, and when Jeremy Hunt was on Radio4 this morning he said: "The truth is we don't know the number." In fact the only numbers we can be certain of are the Department of Health figures for the 2011-12 bill for treating foreign nationals. These figures show the total bill was £33m, and that £21m of this was repaid by the patient or their home nation under a number of international agreements. This means health tourism officially cost us £12m last year - 0.08 per cent of the total budget, and nowhere near any of the figures bandied about of late. But yet that figure's not reliable either, because it's thought we charge for less than half the care we should and there are plenty of mistakes in the system. On top of that the Royal College of Physicians says the staff costs of implementing the crackdown - of making NHS employees check immigration status and chase up outstanding bills - is £500m. That's two and a half times Jeremy Hunt's anecdotal best-guess for how much the problem might cost us in the first place, and which figure, incidentally, came originally from an estimate by debt collector. Well, first, the NHS is free at point of need. Anyone in this country whose appendix suddenly bursts can and will be treated by a competent team of doctors and nurses at their nearest hospital. Secondly, we don't want doctors to look at a patient bleeding out on the ground and saying 'well, is he one of ours?' before they dive in to save his life. Thirdly, a lot of foreign nationals who are migrant workers and inadvertently fall ill, or are students who get knocked down by a bus, either pay taxes or are eligible for free treatment because they're in the EU. Britons get free treatment in other EU countries in much a similar way, or are supposed to. And fourthly, if they've got something infectious like rabies, ebola or TB it would be handy if they got treated sharpish rather than wandering the streets infecting everyone else because they can't afford a surcharge. The way out of this mess is two-fold. To start with we could spend a year giving every NHS patient a survey to fill in before they are discharged about their country of residency and tax status. 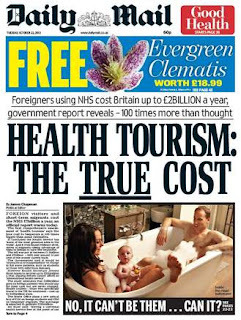 Then perhaps we might end up at a figure for 'health tourism' that would be at least be within squinting distance of the truth. And after that, we should take every announcement of a crackdown, estimated bills and official government guesstimates with a big, fat, heart-attack-inducing pinch of salt. There's always more to it than the headline. It never killed anyone to read more.